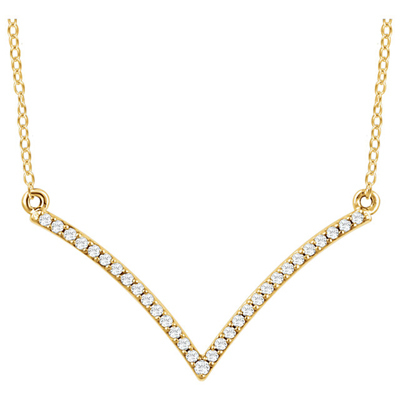 This stunning yet simple necklace will quickly become a staple of your wardrobe. It looks equally as good dressed up as it does with jeans and a t-shirt. 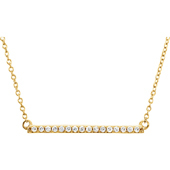 It is the perfect necklace to add some serious bling to any outfit! 16 I2 Clarity, H Color diamonds have a total carat weight of .14 carats.14k yellow gold pendant measures 14mm x 28mm and comes with an 18 inch cable chain. 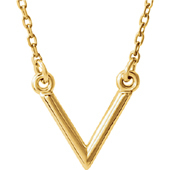 We guarantee our 14K Yellow Gold "V" Shape Diamond Necklace to be high quality, authentic jewelry, as described above. 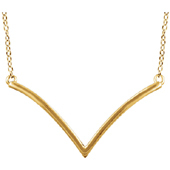 14K Gold "V" Necklace, 16-18"